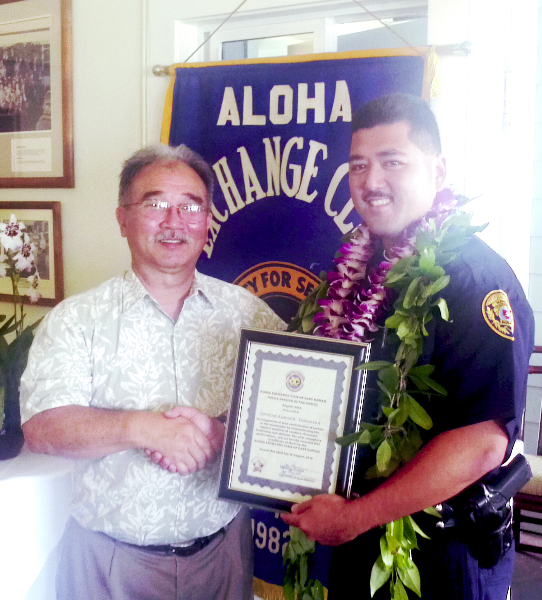 Hilo Exchange Club member Jay Kimura presents an "Officer of the Month" award to Aaron Yamanaka. The Aloha Exchange Club of East Hawaiʻi recognized Officer Aaron Yamanaka on Thursday (August 23) as “Officer of the Month” for August. Yamanaka, a school resources officer assigned to the Hāmākua District, was honored for his role in the arrest of a suspected car thief. At 6:30 a.m. on August 1, Yamanaka was on his way to work when he observed a Honda Accord being driven in a reckless manner on Highway 19 heading toward Waimea. 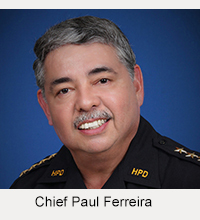 The officer followed the car, which had been reported as stolen earlier that morning from a shopping center in Waimea. The Honda left the highway and came to a stop at a dead end on Palikekua Street in The Honokaʻa Oceanview Subdivision. The driver then fled on foot but Yamanaka got a good look at him before he disappeared into the bushes. Police investigation led to the name of the suspect, who had been charged with another car theft a few days earlier but had been released after posting bail. Later that morning, citizens in the area where the stolen vehicle had been abandoned reported seeing a man running into the transfer station road. Yamanaka responded to that location and identified the man as the suspect he had seen exiting the car, although the suspect had discarded some of the clothing he had been wearing earlier. As a result of Yamanaka’s efforts, the victim’s car was returned intact within a few hours of having been stolen. 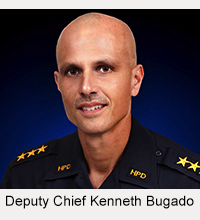 Detectives in Kona later charged the suspect with unauthorized control of a propelled vehicle, unauthorized entry into a motor vehicle and reckless driving. Meanwhile, Yamanaka searched the tall, thick grass and bush area and found the suspect’s discarded clothing, which he recovered as evidence.